Full: This means that each transition is fully animated. When learners move through your interaction, elements on the screen move into place in succession. Fade: This means that elements of the screen fade into place in succession (rather than moving). Appear: This means that all elements of the slide appear at once; the screen doesn't build with any fades or animated movements. Rounded Corners: This gives your media slightly rounded corners and a shadow. Drop Shadow: This adds a shadow and a thin border to your media. None: This displays your media without any shadows or borders. Choose a Title font. 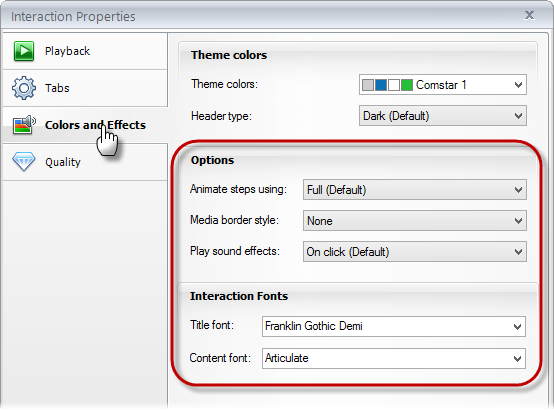 The title font is used for the title of your interaction and the title of each individual step. Choose a Content font. The content font is used for the details of each step in your interaction.